You are blessed. 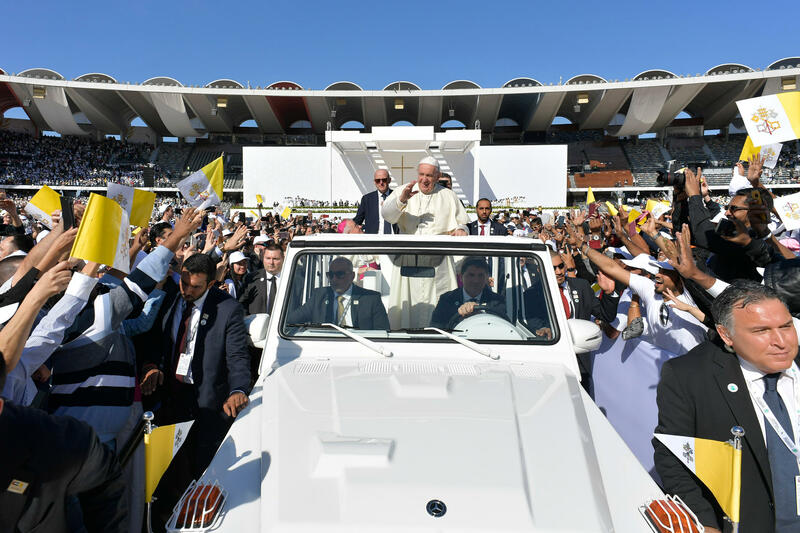 This was the simple but profound message Pope Francis brought to a crowd of some 180,000 on February 5, 2019, in his homily at Mass in Zayed Sports City. It was a mostly expat crowd with workers in the United Arab Emirates hailing from more than 100 foreign countries. And it was an enthusiastic crowd. “Blessed: this is the word with which Jesus begins his preaching in Matthew’s Gospel. And it is the refrain he repeats today, as if to fix in our hearts, more than anything, an essential message: if you are with Jesus, if you love to listen to his word as the disciples of that time did, if you try to live out this word every day, then you are blessed,” the Pope proclaimed. “Not you will be blessed, but you are blessed; this is the first truth we know about the Christian life. It is not simply a list of external prescriptions to fulfill or a set of teachings to know. The Holy Father reminded the faithful present that the joy of being a Christian cannot be taken from us, no matter what our circumstances. He cited the Beatitudes, in which those called blessed are not the rich and powerful but the poor, the meek, and those who are persecuted. This is the reason for our joy, a joy that no one in the world and no circumstance in our lives can take from us. It is a joy that gives peace also in the midst of pain, a joy that already makes us participate in that eternal happiness which awaits us. Dear brothers and sisters, in the joy of meeting you, this is the word I have come to say to you: blessed! The Holy Father noted that “living out the Beatitudes does not require dramatic gestures.” He pointed out that Jesus left nothing written, built nothing imposing, and didn’t ask his followers to build great works or draw attention to themselves. He said those who follow the Beatitudes are the meek and those who are peacemakers.